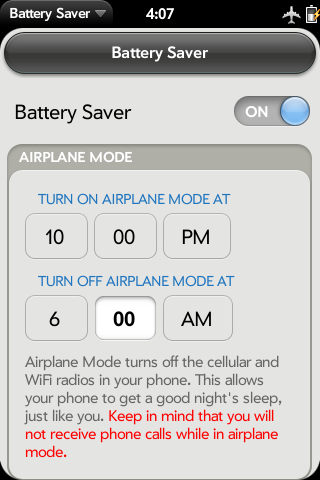 Battery Saver automatically turns on Airplane mode each night at your scheduled time. This will not only extend your battery life but give you a quiet night's rest free from phone calls, messaging, and email alerts. Then each morning Battery Saver turns the Airplane mode off, letting the world back into your life. You don't need to keep the card open. After launching it once, the timer will keep working until you reboot the pre. The On/Off switch at the top allows you to turn off battery saver. On means it will turn airplane mode on and off; Off means it will no longer do that. Right now, there is no validation of the airplane mode on and off times so if you set the "Turn on Airplane mode" to be before "Turn off Airplane mode" it will not do anything useful.